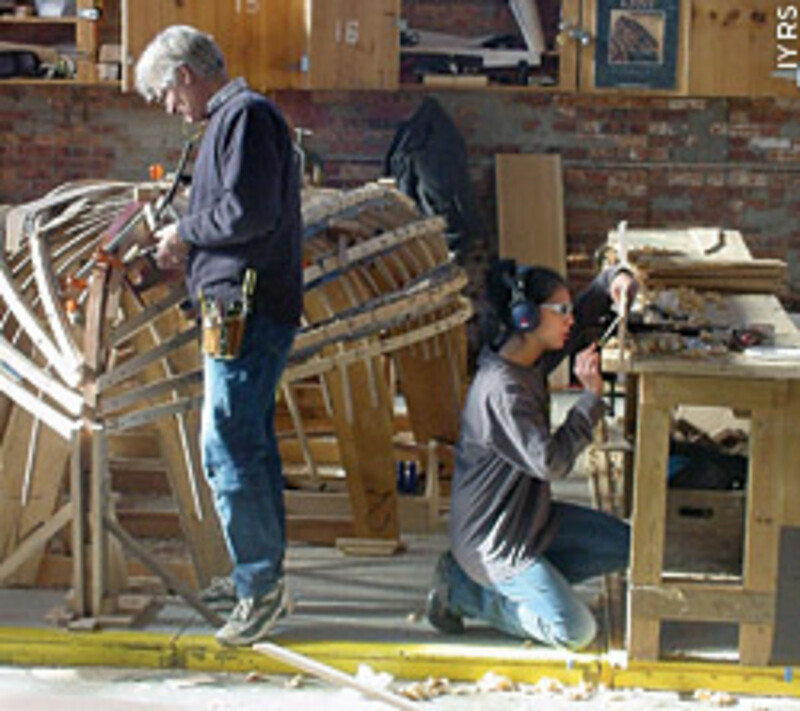 As part of an effort to stimulate potential employees in marine industry careers, the International Yacht Restoration School in Newport, R.I., hosted the inaugural Rhode Island Marine Trades Day. Tryska is active in the educational programs of RIMTA, which sponsored Marine Trades Day. About 300 people walked through the facility between 9 a.m. and 12 p.m. Oct. 25, talking with representatives and picking up literature at the booths of more than 120 firms. Exhibitors included the MotoRing Technical Training Institute and New England Institute of Technology; youth-oriented community assistance organizations such as My Turn Rhode Island and Mosaico Community Development Corporation; as well as several economic development agencies. Tryska says the show had two main goals: to provide an open house for those looking for a career change or career opportunities, and to increase the awareness of the marine trades impact on the economy statewide. Tryska says having the event at IYRS showed a perfect example of a clean, well-lit environment where people could learn and work. One such group featured at the show that is “filling the gap” is the IYRS Marine Systems facility in Bristol, R.I. About two years ago, IYRS partnered with the American Boat and Yacht Council (ABYC) to develop the training program designed to teach students how to install, maintain and repair the major systems found in both power and sail boats. Classes include a balance of classroom and hands-on study. 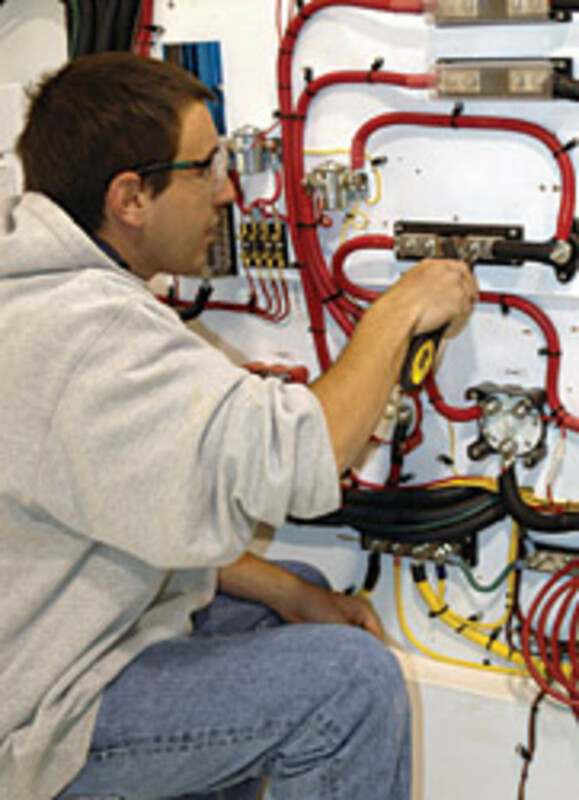 Subjects include electrical systems, electronics, steering systems, fuel systems, diesel/gas, inboard/outboard engines and sail drive systems, marine pumps, on-board tankage, marine sanitation systems, marine LPG systems, AC/refrigeration systems, and firefighting systems. Alameida’s classroom philosophy is a combination of lectures and hands-on practice. The facility contains four hulls students outfit like an actual boat. Alameida says some interested people are reluctant to go job hunting in the marine industry because it is so deeply into a down cycle. But plenty of opportunities exist, he says. Students who leave the systems school with ABYC certification are very attractive to employers because boats already built and sold still need to be repaired and maintained by skilled workers. Alameida says students do not need prior experience with the marine industry, but they must exhibit an interest in the field and be highly motivated. John Headley, for example, has always been interested in boats and was a computer technical consultant in Chicago. “I moved the whole family up here, and this is something totally new,” says Headley. “My job in Chicago just played out. I was there for eight years and, long-term, it just wasn’t what I was cut out for." Headley admits outside of sailing as a child and powerboating on occasion as an adult, his knowledge of boats is limited. What he would eventually like to do is start a marine business and do boat rehabs on the side. Leo Ragasa says he moved here from the Philippines after working on boats for seven years in Micronesia. He is being sponsored for extra training by a friend in New Mexico and says he hopes this will qualify him for a better job. Alameida says every student at the end of the course must take a five to six-week “externship” that involves working with a potential employer to see how they cut it in the real world. Alameida notes that the IYRS Marine Systems program is supported by the Rhode Island Marine Trade Association and Shannon Yachts, which donated three hulls to them in the last year. Guy Gauvin, 45, general manager of Goetz Custom Boats, also in Bristol, says he was pleasantly surprised with the turnout at the show. Gauvin says many visitors were pleased and surprised to find the new facilities were air-conditioned and free of dust and fumes, and that boatbuilding was so technologically advanced. As for potential employees, Gauvin says Goetz looks to applicants coming from IYRS, New England Institute of Technology and The Landing School in Maine. Gauvin believes the employment pool will grow, citing trends toward larger yachts and the need to modernize and upgrade to compete on a global level.